Confession time: I always like the "bad guys" in books and movies. I wanted Winona Ryder to end up with Ben Stiller's character in Reality Bites. I thought Suzanne Collins assassinated the character of Gale in Mockingjay. So when I saw that the protagonist of Sarah Dessen's latest, The Moon and More, would be caught in a love triangle between her hometown love and a New Yorker visiting for the summer, I figured I would end up really liking Theo, the urban filmmaker, and then be disappointed by him in the end. Thankfully, Sarah Dessen is better than that and gave me characters and an ending which I did not see coming. I've written about Dessen's formula before, but it's successful and keeps me coming back for more. 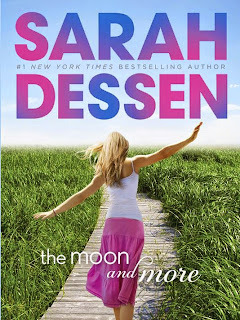 It's interesting to see her novels evolve as Dessen ages: parents play more of a role, there is more frequently a young child character, and the protagonist tends to resemble the author's Type A personality. I like these changes, as it rounds out the world of Colby, North Carolina, where all of her novels are set. It's always fun to get glimpses back into the lives of past characters, and Dessen is generous in building the world for her readers. As for The Moon and More, I liked it. I read it in one day and found myself telling loved ones, "I really like my book" when I occasionally came up for air. Emaline, the protagonist, is on the brink of many changes in her life as she ends a relationship, starts a new one, prepares to leave for college, and gets reacquainted with her long-absent father. That's a lot to handle in the course of two months, and a lot to tackle in a novel. Dessen is up to the task, showing how the mounting stress in Emaline's life affects her and those around her. I wanted Emaline to be a bit more joyful, but that isn't who the character is and I respect that. I look forward to checking in on Emaline in future novels, but continue to wish that the secondary characters were the focus, as they are usually more interesting!